Smog and Ambuscade is the original and first of the Steam Highwayman gamebooks. Written, crowdfunded and published in 2017, it went on sale in spring 2018. After choosing your backstory as the Steam Highwayman, you as the reader are thrown into a nineteenth century that never was, but might have been, to make your living or lose your life on the midnight road. Set in a region of England centred on Marlow, I wrote Smog and Ambuscade at least partly in homage to the countryside where I lived between 2008-2012. You can read more about that here. If you would like to see the original campaign for Steam Highwayman: Smog and Ambuscade on Kickstarter, complete with public updates and funding info, follow this link. Who is the Steam Highwayman? On Youtube I created a read-through, choice-driven audio adventure based on extracts from Smog and Ambuscade. 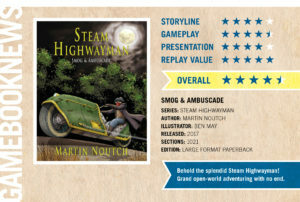 Michael Reilly of Gamebooknews.com completed a full review of Steam Highwayman: Smog and Ambuscade in June 2018. There are also several reviews on Amazon and Facebook. You can see some of the page previews originally prepared before the printing of Smog and Ambuscade here. If you got your hands on an early printing of Steam Highwayman: Smog and Ambuscade, there were unfortunately a series of errors in links and some details of gameplay, later corrected (in printings marked Revised June 2018 on the copyright page.) Full corrections to the first edition are available here. Ben May’s artwork for the book has been invaluable, both in attracting readers and in helping me visualise the world I have been writing. Some of the illustrations for Smog and Ambuscade are available here. 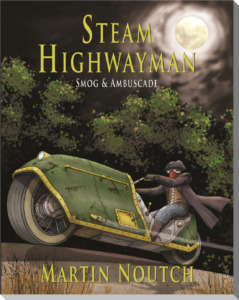 As social rewards during the Kickstarter for Smog and Ambuscade I prepared these devlog documents about the process of creating the look of the Steam Highwayman and the iconic Ferguson velosteam. If you’re interested in what it’s like to work with an illustrator as an independent publisher and author, take a look. 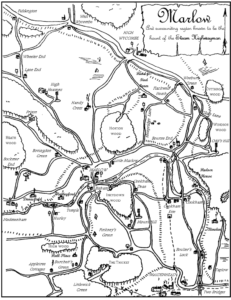 The open-world nature of the gamebook demands an interesting and explorable map: I took the real geography of the area around Marlow on the river Thames and imagined how it might have been in an alternate nineteenth century. 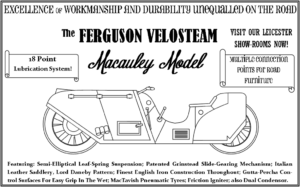 Here’s a long list of all the blog posts that relate directly to Steam Highwayman I. You can also search in the widget on the sidebar for anything tagged with Steam Highwayman.